February 10, 1926: “The Gumm Sisters” (Judy and her sisters) performed at the Grand Rapids Women’s Club Benefit for Permanent Boys and Girls Scout Camps Fund, held at the theater that Judy’s father, Frank Gumm, owned, the New Grad Theater, in Grand Rapids, Minnesota. 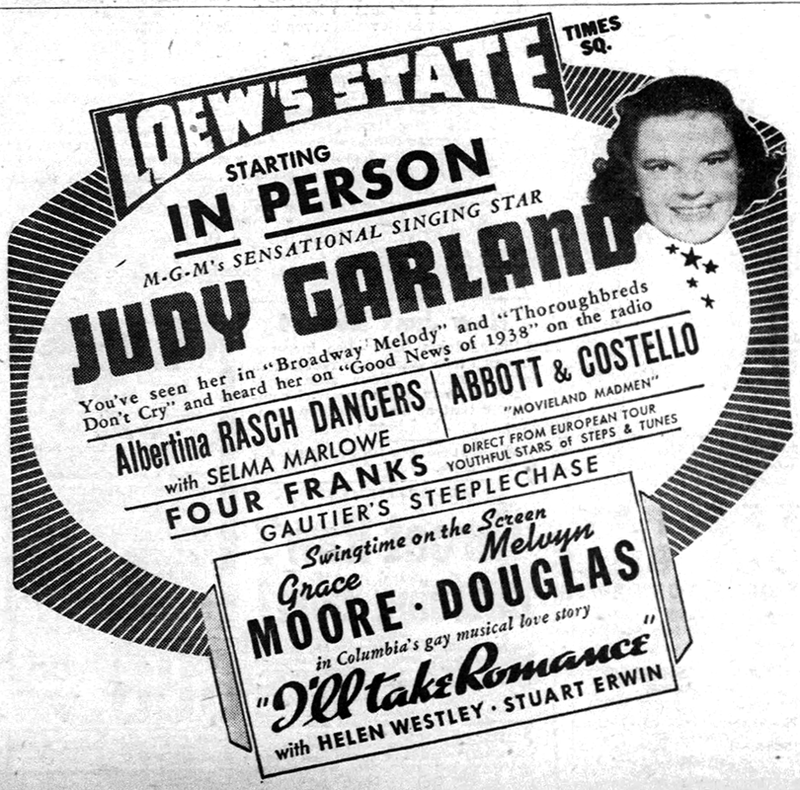 February 10, 1938: Judy made her first appearance on a New York stage, the Loew’s State, as part of her personal appearance tour supporting her recent film Everybody Sing. Accompanying Judy on this tour were her musical mentor, Roger Edens (seen at the piano in the photo), and her mother, Ethel. Judy’s appearance at the State grossed $10k more for the theater than their average weekly gross at the time. Thoroughbreds Don’t Cry was still playing in theaters around the country and along with Everybody Sing, Judy was definitely in the public eye. February 10, 1939: Judy attended Artie Shaw’s opening at the Palomar nightclub in Hollywood, California. Shaw as Judy’s first “adult” and “true” love. Judy believed that she and Shaw would marry in spite of the fact that he didn’t reciprocate her feelings. When he eloped with Lana Turner, Judy was devastated. It was around this time that MGM appointed Betty Asher as Judy’s assistant. 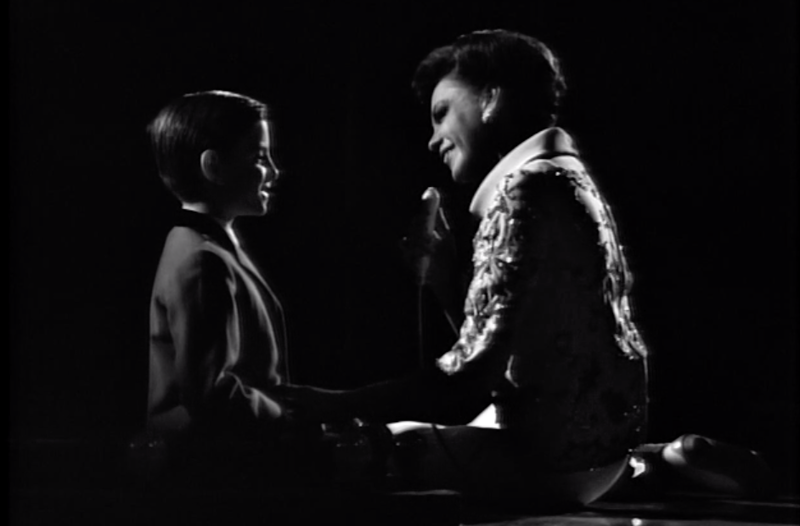 Asher turned out to be a studio spy and Judy was again devastated when she found out several years later but not before Asher stood up with Judy for her marriage to Vincente Minnelli on June 15, 1945. 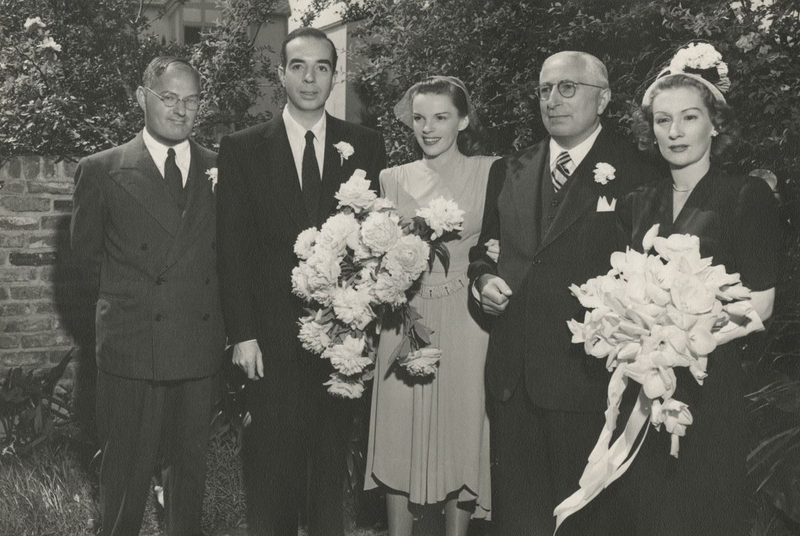 Photos: An undated photo fo Artie Shaw; Ira Gershwin, Louis B. Mayer, and Betty Asher pose with newlyweds Judy and Vincente Minnelli on June 15, 1945. February 10, 1943: Filming continued on Girl Crazy, specifically the “Interior Western Dance Hall” set, after being out due to overwork and exhaustion. Time called: 10:00 a.m.; dismissed: 6:00 p.m.
Sheet music scan provided by Kim Lundgreen. Thanks, Kim! February 10, 1944: This snapshot was taken of Judy and fellow MGM star Hedy Lamarr at the premiere of the film version of “Lady in the Dark” starring Ginger Rogers. It’s amazing that Judy never thought of herself as beautiful. As this photo proves, at this point in her life she could more than hold her own with someone like Lamarr. Earlier this day Judy had an easy one at MGM. She worked on “Synch Loops” (dubbing) for Meet Me In St. Louis. 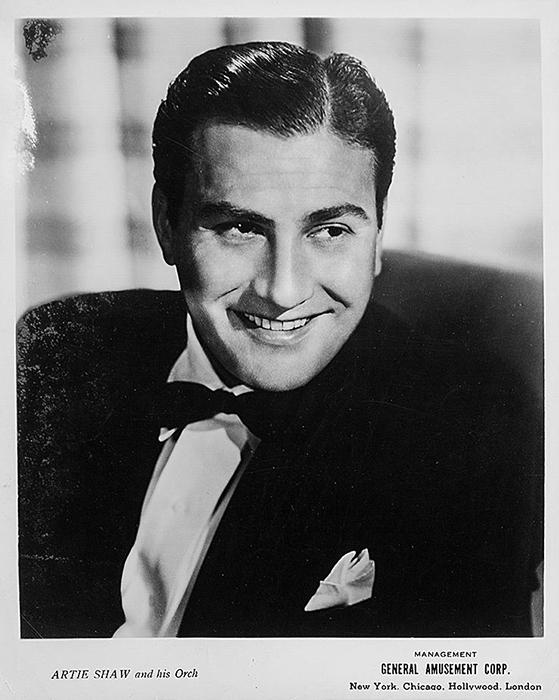 Time called: 1 p.m.; Judy arrived at 3:15 p.m.; dismissed: 4:40 p.m.
February 10, 1945: This four-page spread appeared in the “Showmen’s Trade Review” promoting Meet Me In St. Louis, The Clock, and Ziegfeld Follies, among other MGM films. 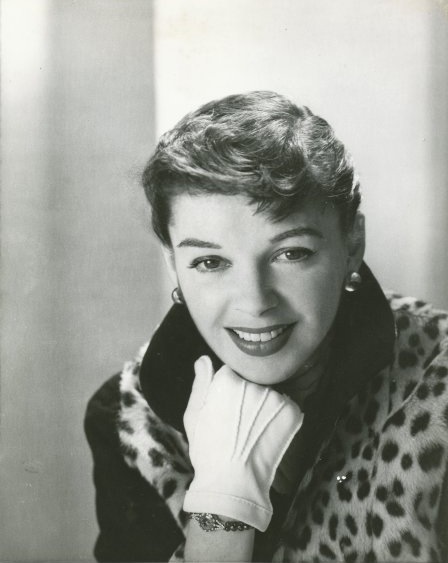 Check out The Judy Room’s Filmography Pages on The Clock at here. 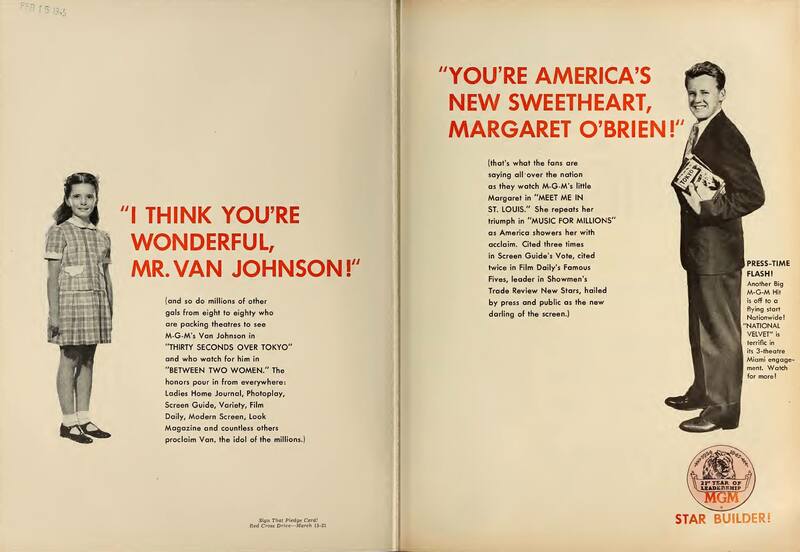 February 10, 1945: This two-page spread also appeared in the “Showmen’s Trade Review” promoting the success of both Van Johnson and Margaret O’Brien in their recent MGM hits, including Meet Me In St. Louis. 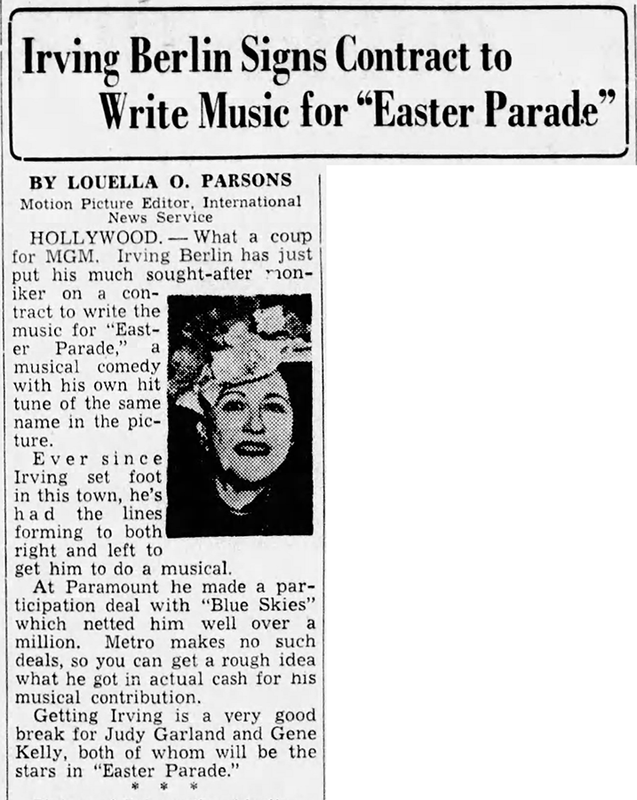 February 10, 1947: Columnist Louella Parsons reported on Irving Berlin being signed by MGM to write new songs for Easter Parade. 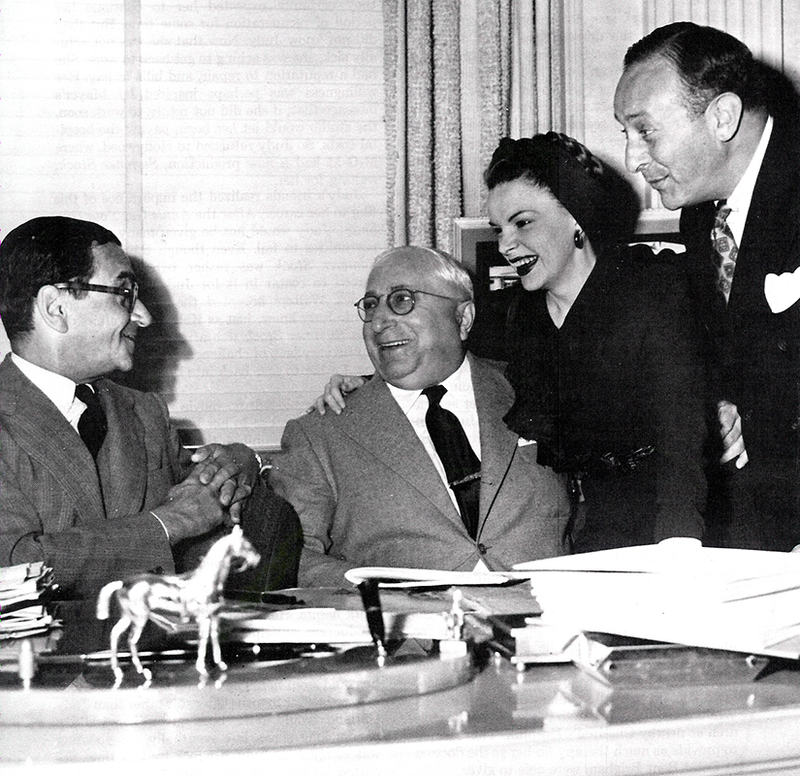 Photo: Irving Berlin, MGM studio boss Louis B. Mayer, Judy, and producer Arthur Freed, pose for a publicity photo promoting the production of Easter Parade. 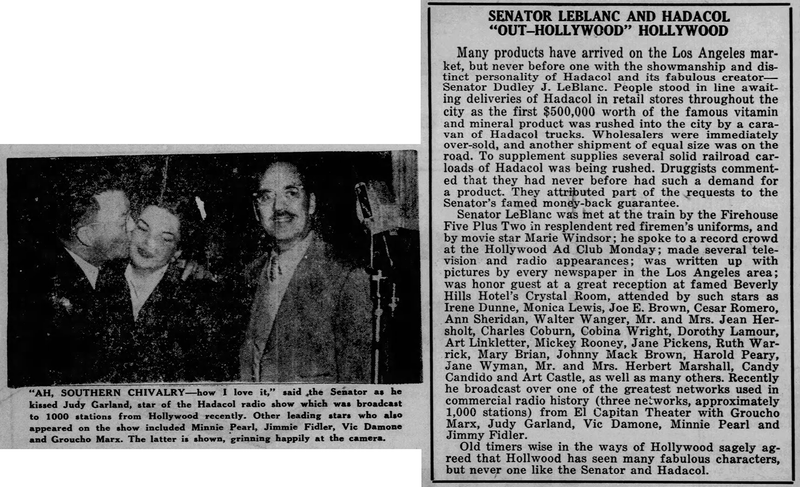 February 10, 1951: This photo of Judy with Louisiana Senator Dudley J. LeBlanc and Groucho Marx was published. 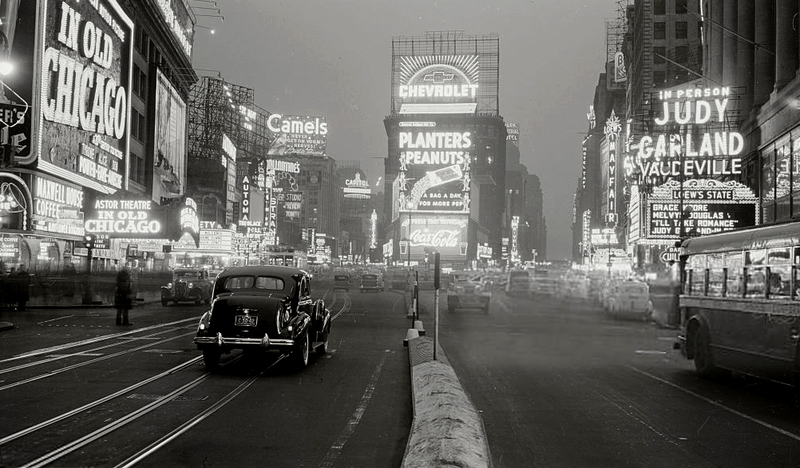 It was taken on January 12, 1951, during the “Hollywood Party” radio show. 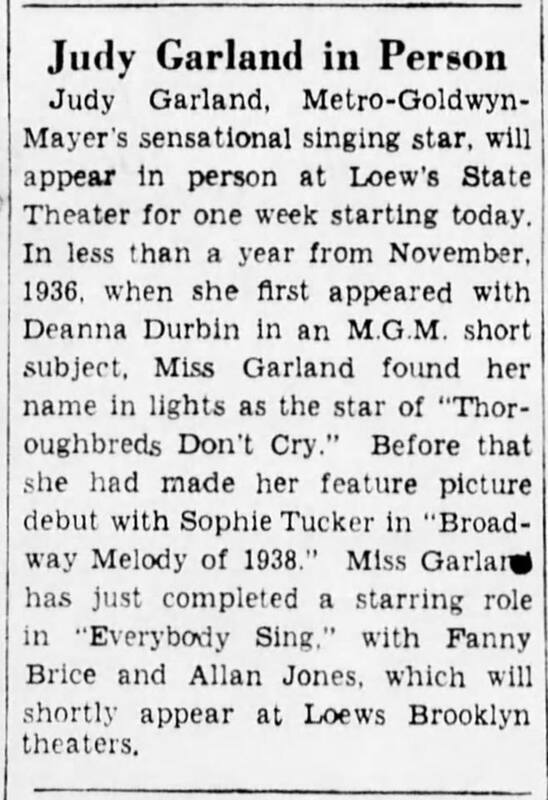 February 10, 1954: Judy was scheduled to continue filming on the “Someone At Last” number continued on the “Interior Malibu House” set for A Star Is Born. 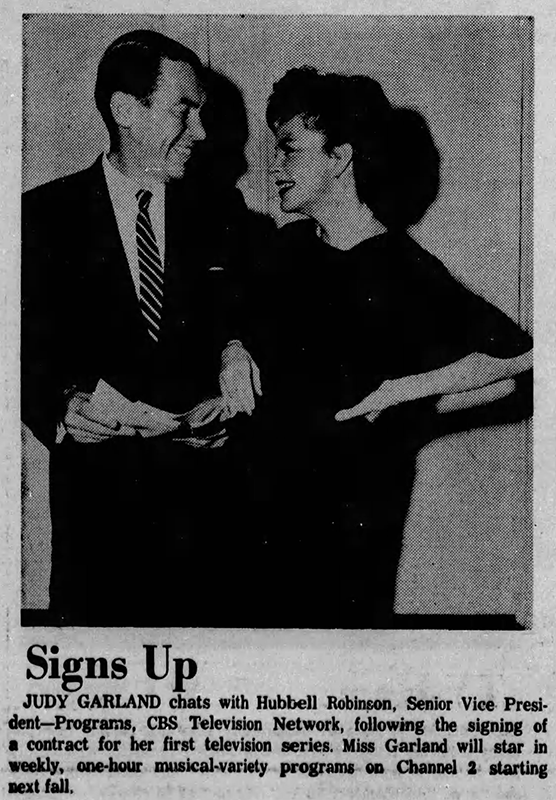 However, the assistant director’s notes state: “Miss Garland reported to stage at 10:10 a.m. – was ill and could not work and left stage at 12:10 p.m.
February 10, 1963: Here’s a photo of Judy with CBS SVP of Programs, Hubbell Robinson, just after Judy signed her contract with the network for a weekly series (which she signed on December 28, 1962). On this day Judy was enjoying her successful engagement at Harrah’s Resort in Lake Tahoe which would, unfortunately, come to an end the next day due to Judy contract a case of the flu. 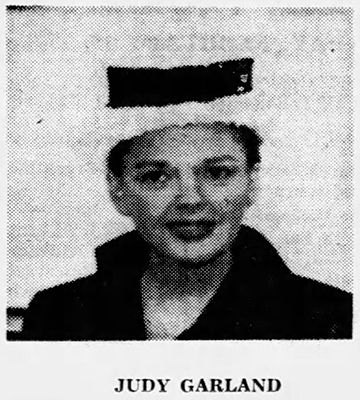 February 10, 1965: On the advice of Dr. L.A. Kane, Judy canceled both the matinee and evening shows of her engagement at the O’Keefe Center in Toronto, Canada, due to a severe cold and laryngitis. The Garland/Lamarr photo is very interesting, as Judy’s looks (and weight) had changed significantly since “Ziegfeld Girl.” But as much as I stand by Judy being very lovely, even pretty at her MGM best, I don’t think she could touch Lamarr technically. Question: Was that 1962 comment made by the ACTOR Jack Weston? ?